Yesterday, I had the privilege and pleasure of teaching Torah on the streets of Los Angeles. 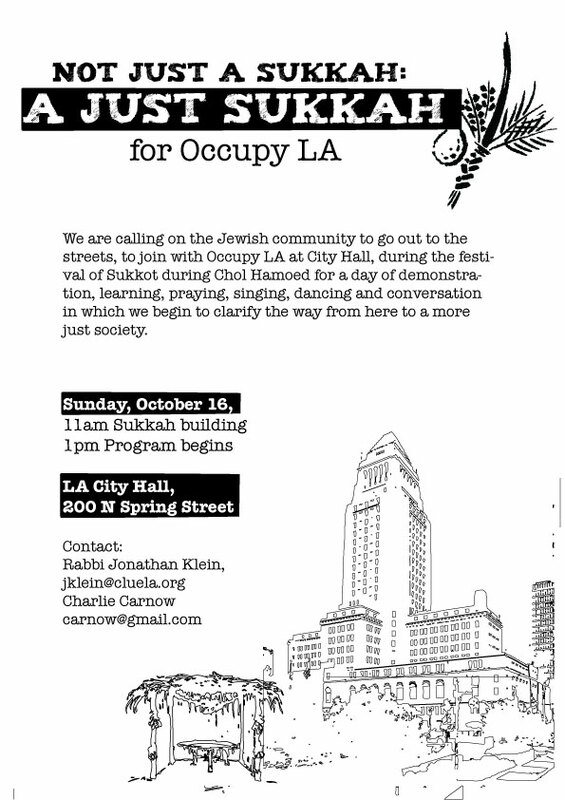 Specifically on Spring Street between First and Temple, on the east side of City Hall, amongst the community of hundreds that calls itself Occupy LA. A coalition of several people with and without organizational affiliations felt the need to be present and to establish a Jewish communal presence among the growing movement of people who were frustrated by and angry at the many injustices that are plaguing this country. We sent out a call and the response was energizing. In five days we had over a hundred people who were committed to attending. And so, on a warm, sunny Sunday afternoon, on the eighteenth day of the seventh month of the Hebrew calendar, Tishrei, I stood before the assembled crowd and laid out texts and offered Torah. Here is a fuller version of what I wanted to teach. The Biblical story of Sodom is one of the more disturbing stories in the Torah. Two messengers of God come to Sodom to save Lot, Abraham’s nephew, from the destruction of the town, which they are to destroy themselves—or have some part in its destruction by God. What is the sin of the town that is so great that it merits the town’s obliteration? The opening of the story frames the sin of Sodom as xenophobia. The two messengers come to Sodom and are greeted by Lot. He welcomes them and implores them to stay with him and enjoy his hospitality. This opening scene is reminiscent of Abraham’s welcoming of the messengers in the previous chapter. Once they settle in to Lot’s house, the story turns darker. The townspeople come to Lot’s door and demand that he produce the strangers so that they may “know” them. They are, in effect, demanding that Lot hand over the strangers to be raped and killed. (This is actually what happens in the parallel story of the concubine of Gibea in Judges 19.) Lot steadfastly refuses to hand over those who are under his roof. However, he immediately offers his daughters instead. Luckily for all involved the messengers are angels and they blind the townspeople and save Lot, his daughters and themselves from a violent death. Only this was the sin of your sister Sodom: arrogance! She and her daughter had plenty of bread and untroubled tranquillity; yet she did not support the poor and the needy. and some say this is the character of Sodom. “What is mine is yours, and what is yours is mine,” this is an ignorant person. “What is mine is mine, and what is yours is mine,” this is an evil person. Why, according to some, is the one who argues for private property, for strong boundaries, who says “What is mine is mine, and what is yours is yours” considered the character of Sodom—a Sodomite? He is not ignorant, or evil. She is not righteous. Is she better or worse than the evil person? I would suggest that in the Rabbinic understanding of Sodom, the one who says “What is mine is mine, and what is yours is yours,” and lives according to this motto as a strong statement, is worse than the evil person who is “merely” a thief. The Rabbinic understanding of Sodom comes across in this statement by Rabbi Levi in the (approximately fifth century) midrashic collection, Genesis Rabba (Parashah 49:10). God explains that God was forced to intervene in Sodom because things had gotten so out of hand that sharing one’s flour with a poor person was considered a capital offense. The sin of Sodom finally was that miserliness, private property, “What is mine is mine, and what is yours is yours,” was elevated to the level of a religious or moral virtue and those who abrogated it, those who shared with the poor, were deemed worthy of capital punishment. 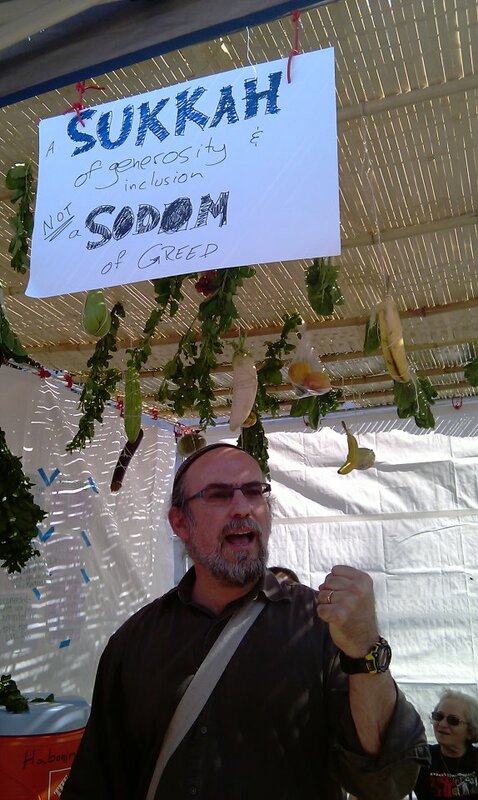 The sukkah as a concrete object and as a metaphor is almost diametrically opposed to the kind of community represented by Sodom. The sukkah, as both an object and a metaphor, suggest a mode of living which is outward directed, generous, responsive to the needs of others and embraces our interdependency. The sukkah in the details of its construction and in its symbolism celebrates permeable boundaries in which our individual identities are not threatened by the existence of others, nor are they dependent on building borders and boundaries. If a sukkah is above twenty cubits [cubit is approximately 22”] in height, it is invalid, but Rabbi Yehudah declares it valid; and if it is not (at least) ten handbreadths [a handbreadth is approximately 3.6”] in height or has not three sides or if its unshaded part is greater than its shaded part, it is invalid. In the case of an “old” sukkah, the School of Shammai declare it invalid but the School of Hillel declare it valid. And what is considered an “old sukkah”? Any which was constructed thirty days before the Festival of Tabernacles; but if it were made expressly for the Festival of Tabernacles, even at the beginning of the year, it is valid. According to the anonymous opinion (which is accepted as the law) a sukkah cannot be more than approximately thirty six and a half feet high. Everybody agrees that it must be at least three feet tall, have three sides and its roof must provide shade. In other words, the sukkah cannot be an overly imposing structure whose impermanence and fragility is not readily obvious; it must be habitable by an adult; it need not be enclosed nor can it be totally cut off from the elements. 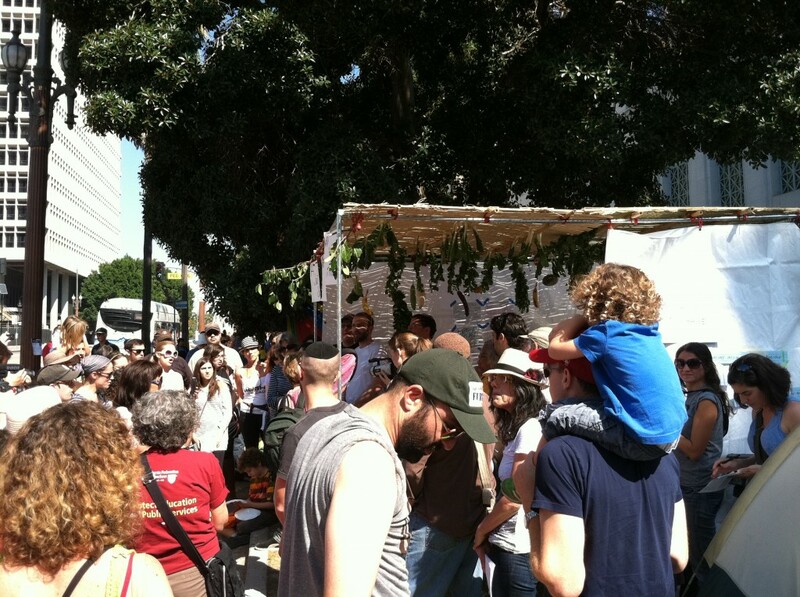 In addition, a sukkah must be newly constructed each year. The intention being that the feeling of impermanence, displacement, vulnerability must also be fresh and not jaded. When one moves into the sukkah, one moves into a structure which does not protect one from the human or natural environment. It is a structure all of whose boundaries are permeable, and therefore is welcoming to others, to strangers. It is a structure which is not secure and therefore assumes the righteousness of others—that other people do not necessarily want to do you harm. Interestingly enough, there is no blessing for building a sukkah, only a blessing for sitting in a sukkah. The assumption is that everybody will inhabit a sukkah, but that not everybody will buildtheir own sukkah and therefore sharing dwellings, opening one’s dwelling to others is built into the structure of the ritual. Finally, as a celebration of this aspect of sukkot the mystical custom of welcoming ushphizin, ancestor-guests, into the sukkah every night developed. This has become one of the animating rituals in sukkot everywhere to this day. If, then, we look upon our sukkot as a metaphor or a vision for a community, it is a community which is built upon generosity, hospitality and the sharing or resources. There is a tradition which can be traced to the Pesikta deRab Kahana that in the end of days the righteous will have a share in the sukkah of Sodom. This is the sukkah of Abraham (whose tentflaps were open to the four directions to welcome strangers) which will overcome the sin of Sodom. And so, this is the starkest form of the choice that faces us. Do we want to build a society in which private ownership is elevated to the level of a moral value and greed is celebrated at the expense of caring for the needy? Or do we want to work together to build a “sukkot society” of generosity, interdependence, sharing and ultimately peace and wholeness? A sukkat shalom. 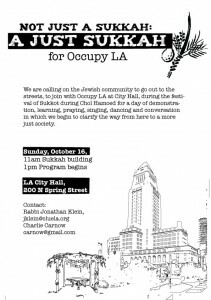 This entry was posted in Occupy LA, poverty relief, Sukkot by admin. Bookmark the permalink.